Fish hang on a line until they are completely dried in the L'Anse aux Meadows National Historic Site in Newfoundland, Canada. At the L'anse aux Meadows National Historic Site in Newfoundland, Canada you will find the remains of an 11th century Viking settlement. In this time period, people would hang fish on the line until they were dried and then prepare them for eating. 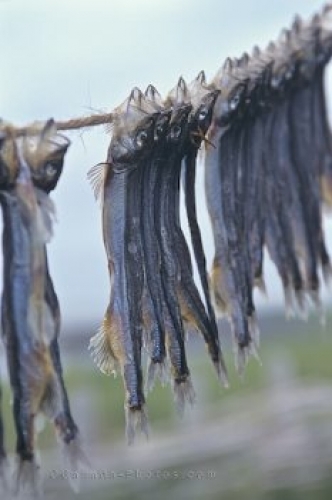 Fish drying on a line on the Viking Trail, L'Anse aux Meadows National Historic Site, Newfoundland, Canada, North America. Picture of a line full of dried fish at the L'Anse aux Meadows National Historic Site, Newfoundland.